The Maiden Tower is a well known symbol of Istanbul, but are you aware of the ancient chains that sit under the ocean? I refer to the chains that stretched under the waters and that stopped foreign warships and pirate trade ships from entering Istanbul’s harbor and the Golden Horn, throughout history. 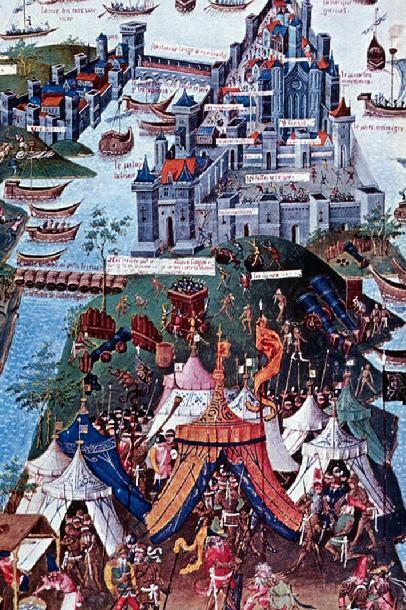 The most famous of these chaıns are the ones the Byzantines stretched at the mouth of the Golden Horn, where the Galata Bridge stands today, to prevent Turkish ships from entering İstanbul during the conquest in 1453. Around the second half of the twelfth century during Emperor Komnenos’ rule,the lesser known of these chains were stretched between the Maiden Tower and the Seraglio Point. In chronological order, starting with the Maiden Tower’s first chains, the story begins. According to the Byzantine historian, Niketas Choniates, Emperor Komnenos had built his summer palace on the historic peninsula that Topkapi Palace stands today. For security reasons, he also built a tower off the tip of the Peninsula where the Mangana monastery was located. He later realized his city's vulnerability to warships ,as well as trade ships that often sailed from the Sea of Marmara; therefore, he erected a second tower on the rocks of Damalis. The Damalis rocks are the rocks the Maiden Tower was built on. It is believed that these rocks were once attached to the mainland at Salacak on the shore of Uskudar. Then it became separated after an earthquake and a water passage was formed between the mainland and the rocks. After building a tower on the rocks, a little fortress was also built around it. Once the fortress was finished, the two towers were connected above the water surface by several floating rafts which were connected to each other by chainrings, as thick as a man’s waist. These measures not only prevented unwelcome ships from entering Istanbul, but they established a customs system that collected tolls from trade ships.Once the foreign ships paid their tolls and passed through customs, the chains between floating rafts were disconnected and the ships were allowed to enter the city harbor.Then one day the chains that stretched between the Seraglio Point tower and the Damalis tower apparently, became so heavy that they pulled the tower on the Damalis rocks into the Marmara Sea, collapsing the tower. While the floating rafts broke, the chains sank to the bottom of the ocean. And maybe after this incident, the Byzantines decided to put the new chain at the mouth of the harbour by the Golden Horn. During my last trip to Istanbul I had the opportunity, for the first time in my life,to set foot on the Maiden Tower. My Crew and I spent two hours enjoying the view of Istanbul from the tower; we were taking lots of pictures, and sipping Turkish tea. While marveling at the magnificent sight, I also tried to imagine where the iron chains once stretched and where they had collapsed into the water. About two hundred meters away from the maiden tower on the Marmara Sea, I could see the early stages of construction for the Marmaray Underground train system, like a black mark ruining a beautiful painting. In my imagination, I was able to pull this black line a little further down and connect it to the Maiden Tower and “see” the pulled chains between the two towers. Later on, I walked down the tower stairs and looked over the rocks, facing towards the shores of the Seraglio Point,at the historic peninsula. The rocks under the tower looked like they had rolled, as a result of a landslide, to the bottom of the sea. I was convinced that the old tower, with the chains around its neck, had rolled down to the bottom of Marmara right at the point where I stood. Now, I will consider the more well known Golden Horn chains. Years ago, I had seen part of these huge rings of chains at the Beşiktaş Maritime museum; but I always wondered where Constantine, the last emperor of Byzantium, actually anchored the chains to prevent Mehmet II’s ships from entering the Golden Horn. After doing a little research, I found out that the chains were attached to an anchor in Karakoy, where the Underground Mosque stands today, and on the other side by the Yali Kiosk which no longer exists.Just like the chains of Maiden tower these were also connected to each other with floating rafts above the water at the mouth of the Golden Horn. Although I spent my high school years in this area, I had never heard about the Underground Mosque. I did not know where exactly the Ottoman Sultans’ Yali Kiosk was located and what had happened to it ? I planned to find some answers to these questions by doing some research, as well as personally checking the area. 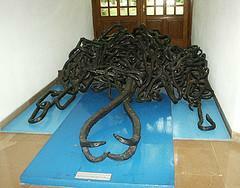 The chains were anchored on the Eminonu side, right below Topkapi Palace, to the walls surroundıng the ancient city. During Sultan Mehmet's conquest of Istanbul some of these walls were ruined and a summer palace,Yalı Köşk, was built on these ruins.When the Ottoman Sultan wanted to make a boat trip on the Bosphorus or the Golden Horn, he boarded his kayik, with the purple awnings, from the dock of this summer palace. Also all maritime festivities were observed by the Sultan from this location. He would welcome the Commander of the Navy and other officers ,returning from an expedition,here at this palace. This Palace was destroyed during the building of the Sirkeci railway station, home of the the famous Orient Express trains, by the orders of Sultan Abdulmecit . For years the chains were left on the streets here, until later they were moved and displayed at the Church of Hagia Irene, within the Topkapi Palace grounds. During my last visit to Istanbul, I was able to visit the location where the other chains were once anchored in Karaköy. Our itinerary was to walk on the Istiklal Avenue in Pera, next take the “tunel” subway down to Karakoy, then take a ferry for a Golden Horn boat trip and visit the sacred mosque of Eyup Sultan, at the last docking station of Eyup. But the “Tunel” was under renovation and closed to passengers, so we ended up walking down the world's steepest vehicle and pedestrian street, breathless and sweating. Walking through the underground passage, we walked in front of the restaurants by the Kadikoy ferryboat station and stopped by a Çay bahçesi, a tea house. My tour friends were tired,so I left them there to take a little breather and enjoy a glass of Turkish Tea. While they were at the çay bahçesi , I wanted to find out the schedule for the Golden Horn ferry boats, buy roundtrıp tickets to Eyüp, explore the underground mosque ,nearby at the Kemankeş street, and take some pictures. I went down the steps, going down from the street level, and entered the mosque which was divided into several sections. There was an archway going through a vestibule all the way to the other street behind the building. The back door of the mosque was at least three meters on higher ground than the front entrance,perhaps that is why the mosque was called “the underground mosque”. Just like the chains across by the Yali Kosk were anchored one time to a fortress, this end of the chains were attached to a tower’s cellar,belonging to the Genoise Walls. The Ottomans called this cellar “Mahzen-i Sultani” or the Sultan’s cellar; and it is known by the public, even dating back to the Byzantines, as the “cellar of lead”, because it was used to store ammunition.To my surprise, after some research, I learned that the Golden Horn chains were used a long time before the Maiden Tower chains, to protect the Byzantines from the attacks of the Ummayeds. Four centuries before a chain was stretched between the rocks of Damalis and shores of Uskudar, in the year 716 A.D., the Umayyad commander, Mesleme, decided to end his unsuccessful siege of Byzantium-which had lasted for seven years. He did not want to carry the ammunition back with him to Damascus ; so therefore put everything into the cellar and sealed it on top with lead. According to a religious myth, during the Ottoman rule a Sheik ,Murat Efendi, told his son, that in his dream he had seen that there were some important people buried under the lead dome of the cellar. According to Murat Efendi, some souls have built a bridge of light between Uskudar on the Anatolian side of Istanbul; and frequently visit the people who are buried here at Karakoy. 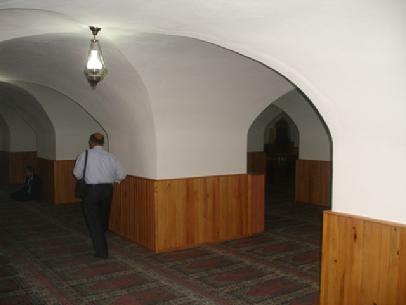 When Murat Efendi’s son told the story ,he heard from his father, to the Grand Vizier, Mustafa Bahir Pasha, the Grand Vizier decided to build a little “mescit” by the cellar for people to do their namaz or praying ritual. During the reconstruction of the site three graves were discovered; two next to each other and one separate. According to Murat Efendi’s story these were believed to be the graves of Vehb Bin Huşeyr’e, Amr Bin As, and Sufyan B. Uveyn, all apparently Umayyad commanders or religious people. Three sarcophagus were put on these graves and a türbe or tomb was constructed on top. This is all, as far as I have seen and learned about Istanbul”s chains under the Marmara Sea.